DIY Home Staging Tips: Should You Decorate with a Wall of Plates? knows how to arrange plates. Do you? 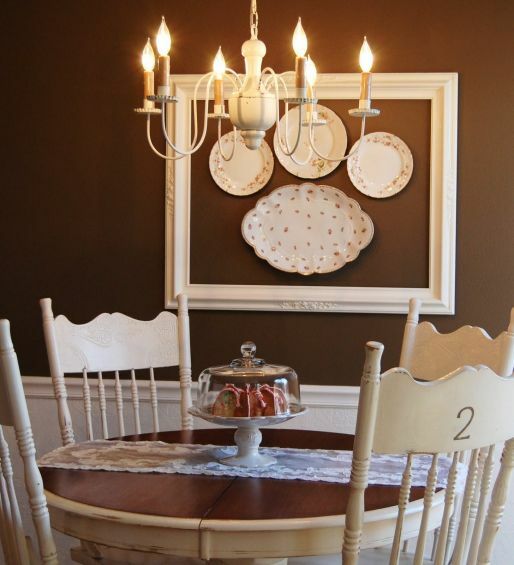 If you’ve spent any time in blogland you’ve seen photos of plates grouped on an interior wall. Some are pretty and some are pure chaos. The question here is, "Are they good or staging a home?" The answer is, "It depends." There's plenty of good reasons why plate arrangements are so popular. 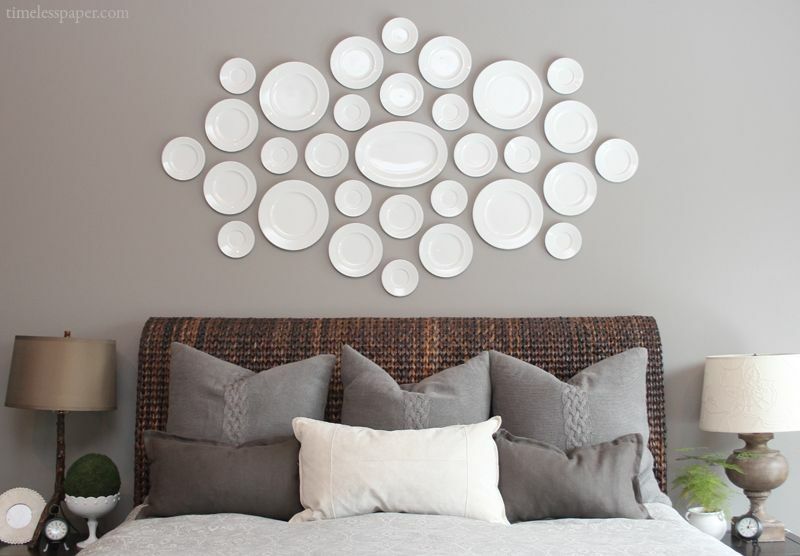 DIY decorators like hanging plates on walls because it’s a relatively easy way to add some color, texture, and interest to a blank wall. Plate arrangements work well in every style of home. You can choose the plates that compliment your home and you’ll look good. They're easy to hang. Work out your arrangement on the floor, and up they go! Plates can be hung with Command strips or other invisible hangers and stay up until we change our minds. Pretty plates are a dime a dozen at second hand stores. And many of us have plates in the closet that are never seen, yet they call out to us for attention. There's plenty to choose from. I’m using the word “plates” here, but I’m including platters, trays, and even bowls and baskets. Talk about variety! There are vintage plates, souvenir plates, hand blown glassware, transferware platters, pricey Delft dishes, thrown and glazed pottery, retro and contemporary melamine, and your common every day dinnerware. If you are looking for an inexpensive way to adorn a wall in your home on the market, here are some guidelines to make those plates add value to your home. The biggest mistake I see with plate décor is too much variety. If you love your home, and you plan to stay there a long time, if you want to give it bundles of personality, then go ahead and cover your walls with whatever strikes your fancy. 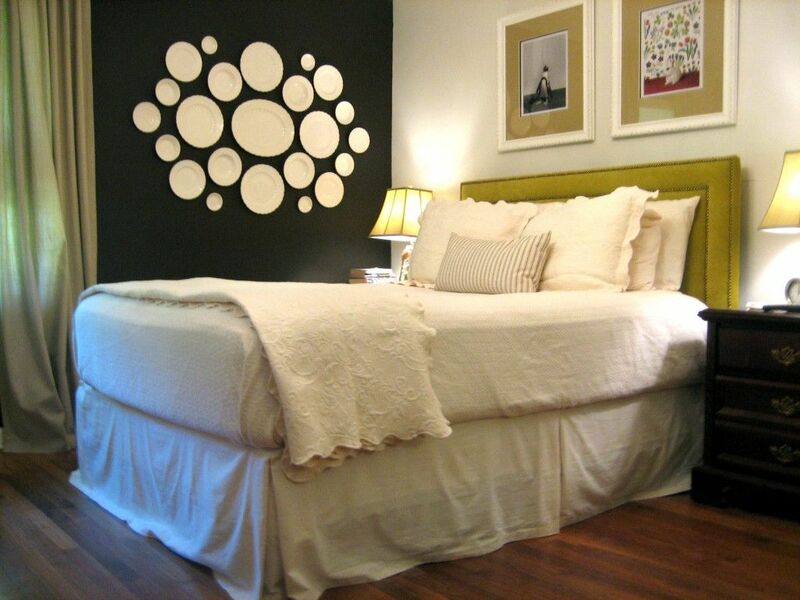 When buyers tour your home, they’ll respond better to a clean and uncluttered home, including your walls. Keep the colors and shapes harmonious. Sound boring? It’s not. It’s effective staging. A plate collection can grow too big. 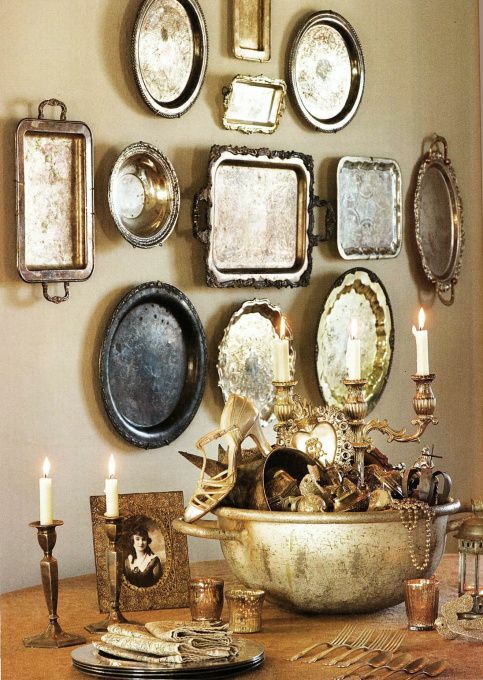 You do not want the wall o’plates to be the room’s focal point. Curate your collection to what’s big and beautiful. Another common misstep is to have too random a placement. Overlapping and crazy quirky arrangements are fine for your funky self, but chances are it will only distract people touring your home, trying to envision themselves living there. a staging formula worth copying. Photo: Emily Arrison at Timeless Paper. 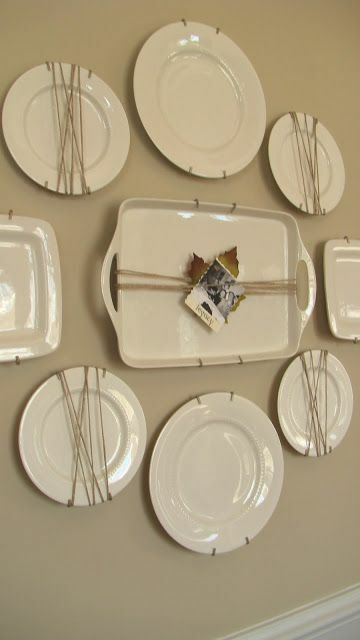 Another example of white plates beautifully arranged on a dark wall, from Nesting Game. A grouping of three similar plates gets surrounded by a frame. Nest, Nesting, Nested. This collection of metal trays by Jennifer Rizzo is unusual but certainly stage-worthy. that shows restraint in its number of plates, if not the color choices. When arranging a grouping of pictures or plates, place your visually heavier, larger selections at the bottom or center of the arrangement. Work up and out from there. Keep the plates close enough so they read as one design instead of a bunch of plates glued to the wall. How wide that space should be depends on the size and shape of the plates, but one to three inches is normal. Use an odd number of items to make it more interesting and less formal. If your collection is a little too eclectic for staging, a formal pattern of placement can make it look less chaotic. To make a narrow room feel wider, place plates in a horizontal arrangement. If you want to emphasize high ceilings or a tall chimney breast over a mantel, make your arrangement more vertical. square of felt hot glued onto it. 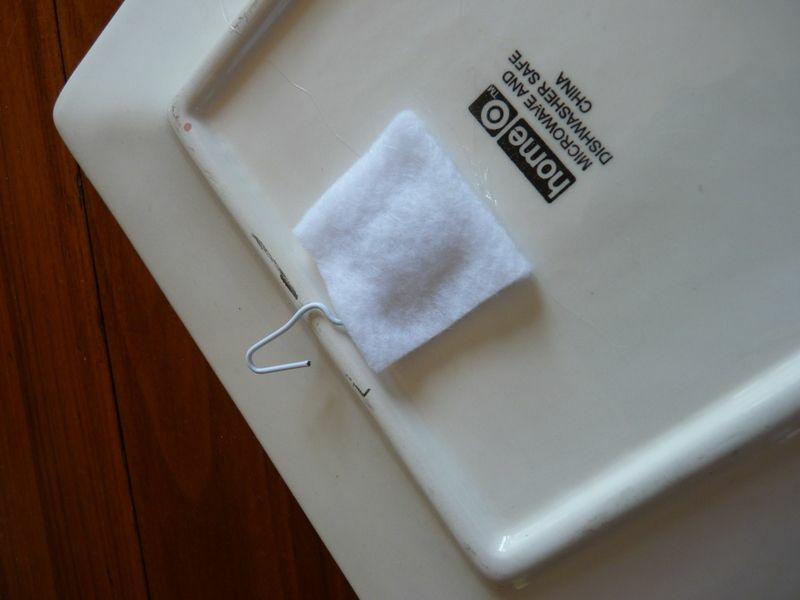 An easy way to make your own plate hanger is to hot glue a paper clip to the back and use a push pin in the wall. Unless the plate is heavy, this works every time. But many decorators like these disc plate hangers from Amazon. Find a way to coordinate your plates. Choose one style, or one material, or one color palette, a specific theme, or identically sized plates. To make the plate arrangement more special, don’t repeat the same elements in another part of the room. You’ll avoid the matchy-matchy, out-of-a-kit look. For a savvy post about using plates as art, decorator with attitude, Joe Davis, writes from experience. 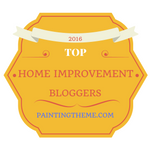 His page is filled with eye candy, some valuable for staging ideas and some not. You be the judge. 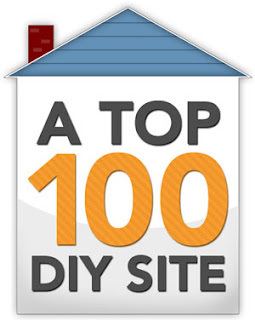 You can learn to make your own home appealing to buyers. Walls dressed up with plates is one simple way to do that. Learn how by following these tips and by experimenting. Because one of the last things your staged home needs is an off-the-wall arrangement of wall plates. 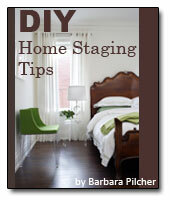 You'll find more advice on prepping your home for sale in my home staging eBook. Download it today for just $4.99.